Posted on March 13, 2014 by Lena K.
2014 has already proven itself as one of the greatest years for us yuri fans. It all started with Sakura Trick in January, and since then, quite a few new yuri anime as well as visual novels have been announced, and stuff like Sakura Trick and Citrus have been licensed by American companies. The year couldn’t be any better for yuri fans, and the following month will yet again prove just how yurirific 2014 will really be. 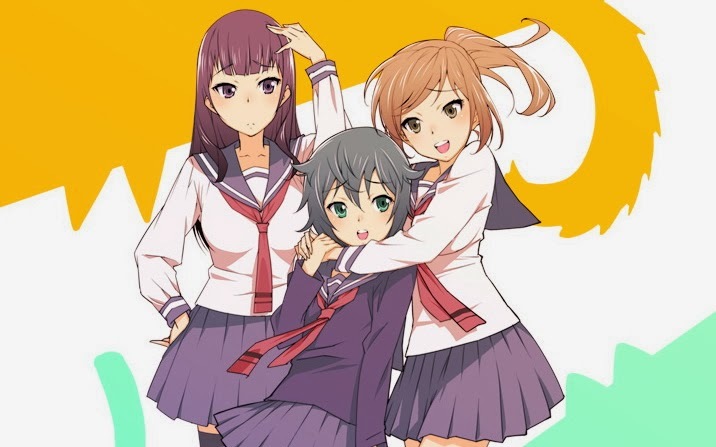 First of all, despite the sad news of Sakura Trick slowly coming to an end, the next yuri show, namely Akuma no Riddle, will hopefully fill that gap by presenting an interesting story and hopefully enough yuri for us to enjoy. The first episode will air on April 3rd. For more information, check the official website. Next, let’s come to yet another yuri anime that will air in April. What I’m talking about is the short series Inugami-san to Nekoyama-san. Just like Akuma no Riddle, this one will also premiere on April 3rd. But Inugami-san to Nekoyama-san will seemingly be a short anime with only 5-minute long episodes. For more information, check the official website or click here for some information in English. Now, let’s talk about the latest Madoka movie Puella Magi Madoka Magica: Rebellion that some of you have probably already watched on the big screen. It’s probably not major news, but ever since this movie was released back in October last year, I’ve been patiently waiting for the DVD and Blu-Ray release. On April 8th, Aniplex USA will offer both a collector’s edition and a standard edition of this movie. For more information, click here. 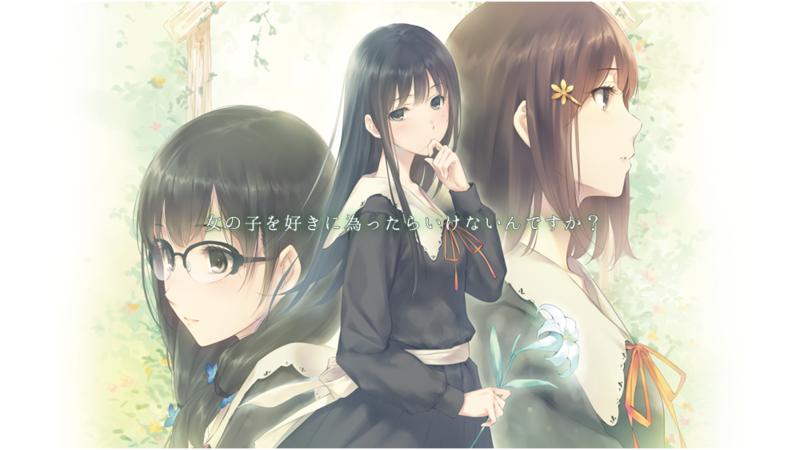 Last but not least, let’s also come to two visual novel releases. Well, Sono Hanabira 16, or The Angel’s Promise, will be released on March 28th (alongside the whole med-school trilogy). Yup, it won’t be released in April, but I thought I should list it anyway, simply because I haven’t made a post about this specific game yet. 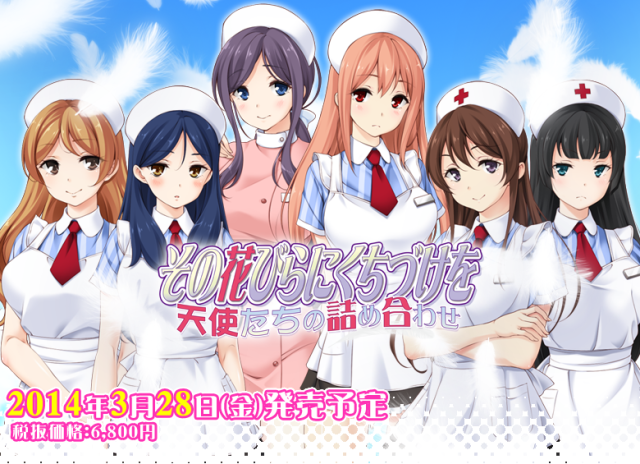 Well, to be honest, I’m not the biggest fan of the med-school trilogy, but I’m nevertheless looking forward to this VN as well. Find trailers, promo pics, as well as the character and plot info at Petal’s Garden. FLOWERS will be released on April 18th. Here’s the translated plot summary: Surrounded by immense walls in the middle of a forest, lies the Saint Angraecum Academy. Suoh Shirahane, a girl with a wounded heart, enrolls in the academy that is teeming with young beauties. Due to certain reasons, this young girl has always remained indoors, and has never been touched by anyone outside of her family. She’s not the most social person, but her new school’s experiment, called “Amity,” will require her to make friends with others, as the program’s goal is to optimize the ability of communication. The “friends” provided by the academy, and a faint feeling of love towards them. In the midst of a quiet academy life, the strange disappearance of an academy student occurs… What will the young girls see in the academy? What will they find there? This entry was posted in Anime, Manga, News, Visual Novel, Yuri and tagged Akuma no Riddle, FLOWERS, Mahou Shoujo Madoka Magica, Sono Hanabira by Lena K.. Bookmark the permalink. Tis a lovely year for the yuri nation. Inugami-san to Nekoyama-san and Akuma no riddle I have extremely high hopes for! I read up to chapter 14 of AnR and I loved it, kinda slow at first but now I realize why and that made it very enjoyable. I enjoy the comedy of ItN as well although there's only a few chapters in English for now. Both appearing on the same day also, yeah I love spring. I've just checked and it seems Akuma no Riddle didn't get licensed, at least not yet. I just realized that I still haven't read more than 3 chapters of Akuma no Riddle. I definitely need to catch up on that. Also, I really hope that there will be enough yuri, please don't let it only be subtext… Ah, well I hope I'll know a little more after reading the first 14 chapters. Akuma No Riddle looks like Yuri meet Grimdark. Awesome. Thank you for your infomation, particularly about FLOWERS. Also, don't forget Futari no Qualia and Hitori no Qualia, to be released on March 28th, yes, MARCH 28th – just 5 days later!!!! BTW Have you watched Frozen? It is quite yurilicious! I watched Frozen some weeks ago, after I realized that the internet is going crazy over that Elsanna pairing.